Cale Hubble is a triple threat: sitter, watcher, reviewer. A scene from "Little Shop of Horrors". 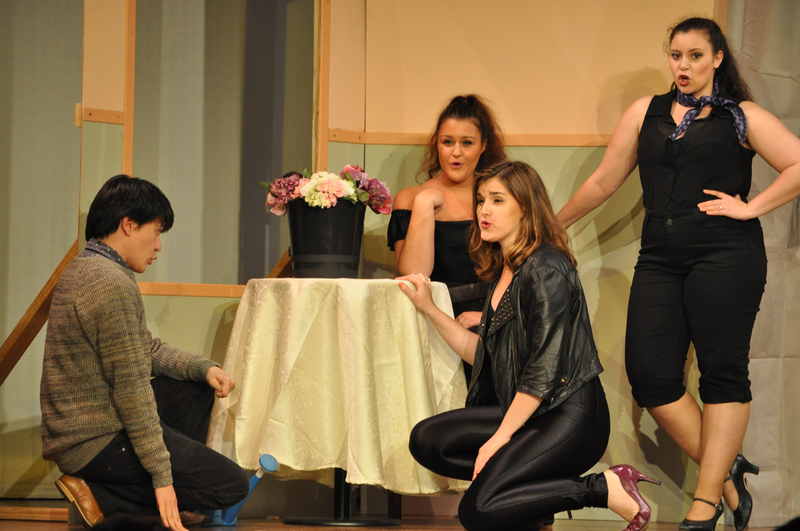 The Sydney University Musical Theatre Ensemble (MUSE) has once again put together a trio of fantastic shows for its repertory season. All the shows require a bit of ‘just run with it’ – whether it’s a man-eating plant in Little Shop of Horrors, an absence of guiding plot in Assassins, or the usual Gilbert and Sullivan nonsense in Patience – but if you do, you’ll have a great trip. The standout of the season – and the ‘dark horse’ according to MUSE insiders – was the hilarious Patience. As a contemporary jazz adaptation of this 1881 comic opera, this show had a clear vision that was consistently followed through on every level. Olga Solar, the Composer and Music Director, deserves the greatest credit, and somehow her jazzy tunes combined with Director Cheryl Wong’s contemporary setting (replete with iPhones and adolescent idiom) to produce a clean, high-paced production that just worked. The whole thing became a long lampooning of hipster culture, with the men boasting scarves, and top buttons occasionally being done up. The script was subtly changed to suit: a reference to “toffee” became “coffee,” opening up the chance for a latte joke. The whole production was ridiculously tongue-in-cheek. Actors never ceased to be engaging and comedic, and visual gags were abundant in the backgrounds of scenes. The entire cast was amazing, with particular mention going to Elizabeth Cooper’s gorgeous soprano, the comic improvisations of Aidan Kane, and the arresting voice of Daniel Hickie. The band was decked out in casual clothes, not the usual orchestral blacks, and this little shift in emphasis was indicative of the attitude of the entire show: laid-back, silly, hilarious and fun. There is something charmingly bizarre about Little Shop of Horrors. First produced in 1982, it still has the distinct feel of the low-budget 1960 film it was originally based on. Director Jaimee Taylor-Nielsen has embraced the absurdity, letting her actors take their roles to their extremes – a particular nod towards Michael Richardson in this respect, with his almost manic portrayal of a sadistic dentist. The leads Matt Bartlett and Katerina Halkeas both have great voices, portraying their roles with touching innocence; the trio of street girls/back up singers when-you-need-‘em (Mary Cowell, Steph Gray and Lillian Kenny) oozed sass; and Peter Hoekstra-Bass had a lot of fun voicing a surprisingly funky plant. Huge kudos also to the amazing Music Director, Robert McDougall, for putting together a very disciplined and talented orchestra. The music was crisp, energetic, and perfectly interacted with the performers on stage. A scene from “Little Shop of Horrors”. Assassins is something of a Sondheim classic, ably brought to the stage by Director Jennifer Bartlett. I find the musical itself to be a series of disconnected vignettes that struggle for relevance outside the USA, but this production brought them together successfully, especially in whole-cast scenes in the second half. This is a true ensemble musical, and these complex characters were convincingly portrayed across the board. Special mention must go to Patrick Howard, whose honeyed tones, consistent accent and engaging stage presence were the centre of this production. Comic relief came regularly in the form of a brilliant Anna Colless. The acoustic panelling on the walls and ceiling of the Tom Mann Theatre felt a lot like monstrous teeth, which worked for Little Shop, but unfortunately its other practical difficulties let down both that show and Assassins – their larger orchestras occasionally obscured, both visually and aurally, the performances on stage. These shows also suffered from some uninspired choreography and overly static numbers. The ensemble members for both, however, were fantastic, with some memorable and hilarious little cameos (I’m looking at you, Chris Dendle and Gabi Kelland). All in all, these shows were a lot of fun. Assassins was a well-staged portrayal of some fascinating characters; Little Shop of Horrors, a rollicking and silly journey through an alternate 1960s; and Patience brought Gilbert and Sullivan kicking and laughing into the 21st Century. Go check ‘em out.